Bali has it all – lush tropical forests, stunning beaches, mountains and a volcano or three to climb, sunshine most of the year, a diverse and rich culture – no wonder it is called ‘The Island of the Gods’. An enchanting island to relax and unwind. Whilst most tourists head for Kuta, Sanur or Ubud (made famous by Eat, Pray, Love by Elizabeth Gilbert), if you travel to the north of the island, the pace is slower, more laid back and less touristy. Travel to Lovina in the centre, Bali National Park in the west or Singaraja in the East. Nestled amongst the 17,000 or so islands that make up Indonesia, Bali is in between the Indian Ocean and the Pacific. It is popular with Australians as it is only a few hours by plane, but with no direct flights from the UK yet, it is approximately 18 hours via one of the larger Asian hubs in Singapore, Malaysia or Brunei. At the moment, Denpasar International Airport in the south is the main airport, but there are plans to build a floating airport in the north by 2025. As this is a long way off, the easiest way to the north, is to get a taxi from the airport to your hotel or villa. Most taxi drivers speak some English and there are set fees to certain destinations. It is a 3-hour drive up the mountains and down again, with many stunning views on the way, as you pass through villages festooned with colourful offerings to the Gods in the small shrines outside each home, the lakes, paddy fields and fields of flowers. 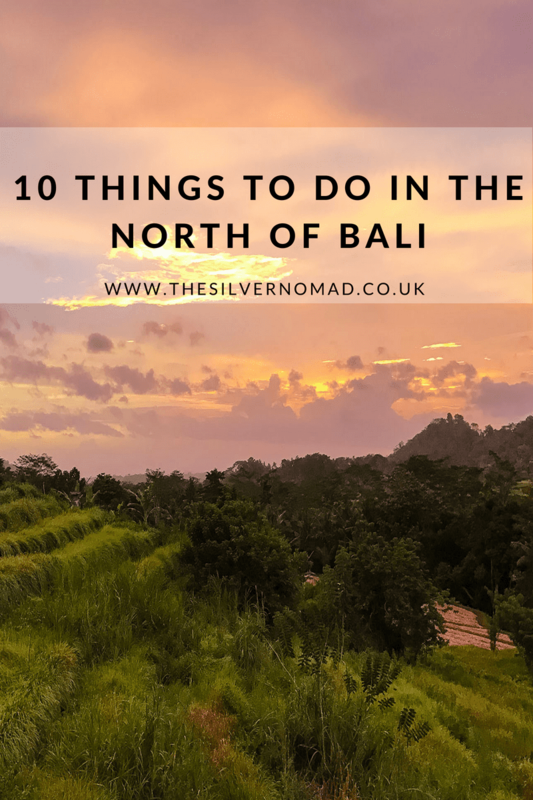 So if you want a different Bali experience, head to the North! Read our suggested tips to make the best of your holiday. The best way to get around is to hire a small scooter and you can zip in and out of the traffic, but if you prefer you can hire a taxi driver for the whole day to give you a guided tour. With several majestic waterfalls in the north each offering something slightly different, you are spoilt for choice. Gitgit, Sekumpul, Aling-Aling, Sing Sing, Banyumala, and some of the lesser known ones including Jembong, Lemukih or Nung-Nung are all worth visiting. For the more adventurous, go canyoning down Kroya or jump from the 5m, 10m and 16m rocks into the pool below! On the main road from Denpasar to Singaraja, you come to the iconic temple of Ulun Danu Beratan with its sacred buildings which seem to float on Lake Beratan is a special place to visit. It is quite magical, very calming and serene, but also with an energy about it that is hard to describe. The gardens are beautiful to wander around, enjoying the view and the serenity. The north of Bali is the place to see dolphins. A 6 am start allows you to watch the daybreak, as the boat takes you out about a mile off the coast. Then you wait patiently for the pods to appear and swim in and around the boats. A knowledgeable skipper will spot the pods and move you in position to watch them as they come up and swim in between the boats. About 3 miles outside of Lovina, are the Banjar Air Panas hot springs. Set in landscaped tropical gardens, hot, sulphurous spring water gushes from the carved stone dragon’s mouths into 3 public pools. There are changing rooms and a shower so you can rinse off. One word of warning, the sulphur in the water can give blonde hair a tinge of green, so try to keep your head out of the water! The Banjar Buddhist Temple is the largest Buddhist temple in Bali and is a popular place for devotees and visitors alike. There is a reverence and serenity to the Temple and a large mediation area for contemplation. The Temple, with golden decorations and carvings, is close to the Banjar Hot Springs and a trip could combine the two. Sarongs are available to hire for a rupiah donation. Just off the north-west coast of Bali is Menjangan Island, which lies within the Bali Barat National Park. Along the shores, Javan rusa deer stroll and take shade under the palm trees. For around £20, a park guide can take you on a guided tour seeing the wildlife, flora and fauna and visiting some of the many shrines on the small island. Whether you are a diver or a snorkeler there is a whole world of colour to explore under the clear waters around the north Bali coast. With stunning reefs, sea turtles, sharks, fan corals and fish of every hue and shade, and purposely sunken structures, Bali’s underwater world is impressive. The best places to dive are Menjangan Island and Pemuteran in the west, where you can dive or snorkel to your heart’s content. Bali cuisine is rich and varied and there are many places to learn how to cook a quick Mei Goreng, Sate Lilit or Ayam Goreng or a simple hot chilli Sambal to impress your guests when you get home. Many of the courses include a walk through the local market to buy the ingredients and fresh vegetables and meat. Although these tend to have an early start, they are worth the effort. Tucked away on the seafront at Singara is the old Chinese Buddhist Temple, Ling Gwan Kiong. With intricate hand-carved wooden pillars in blues, greens, reds and golds, the dragon-topped bridge over the lotus pond takes you to the Temple. Turtles roam the tiled floors and ponds in the temple and a temple guide will provide you with a history of the building, its many drawings and relics. You can pause and take a moment of reflection in front of the beautiful altar. There is no entrance fee, though donations are much appreciated. Every warung or restaurant serves Bali Kopi. Balinese coffee is a rich, finely ground coffee which is normally taken with a teaspoon (or two) of sugar. There is also Luwak coffee which is made from beans that have been digested by the Luwak (Asian civet cat), then collected, washed and roasted. It is earthy, smooth but has a less bitter taste than normal coffee. This post is fantastic! I’m looking at booking a ‘less touristy’ trip to Bali soon and this has given me great ideas! I cannot wait to experience this beautiful part of the world! You will have a fantastic time. Bali is one of our favourite places to visit.